Ted Baker Watches	There are 13 products. Ted Baker watches at Macintyres of Edinburgh. 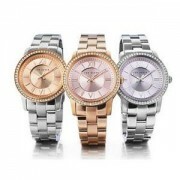 Save up to 30% off RRP on these sleek and stylish designer watches by joining our exclusive membership club for FREE. Free UK delivery on orders over £50. Ladies stainless steel gold plated chronograph watch. Red and white stone set bezel with a mother of pearl dial. Ted Baker watches come with a 2 year Guarantee. Ladies stainless steel gold plated blue dial black leather strap watch. Ted Baker watches come with a 2 year Guarantee. Ladies Ted Baker stainless steel lilac dial stone set bezel watch. Ted Baker watches come with a 2 year Guarantee. A Ted Baker gents stainless steel gold plated chronograph watch. Black dial with three chronograph sub dials. Ted Baker watches come with a presentation box and 2 year Guarantee. Gents stainless steel black ion plated chronograph watch. Silver dial with three chronograph sub dials. Ted Baker watches come with a 2 year Guarantee. Gents black dial stainless steel black ion plated mesh strap watch. Ted Baker watches come with a 2 year Guarantee. Gents blue dial stainless steel mesh strap watch. Ted Baker watches come with a 2 year Guarantee. Gents stainless steel black ion plated chronograph watch. Black dial with coloured sub dials. Ted Baker watches come with a 2 year Guarantee. Ladies stainless steel mother of pearl dial with 24 hour, day and date sub dials. Bezel set with white and red stones. All Ted Baker watches come with a 2 year Guarantee. Ladies stainless steel medium sized mesh bracelet watch with a graduated green dial. Hour batons marked with Swarovski crystals. All Ted Baker watches come with a 2 year Guarantee. Gents stainless steel chronograph watch. Black dial with black mother of pearl sub dials, blue numbers and silver roman numerals. All Ted Baker watches come with a 2 year Guarantee.